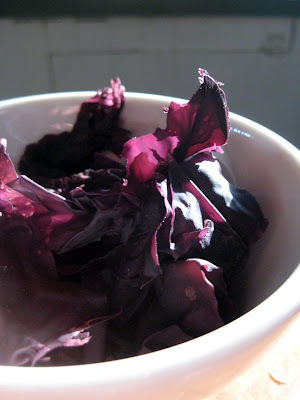 Okay, the Seaweed of the Month Club is coming to a close, so here is the last sea vegetable on our list: Dulse. Hailing from the North Atlantic coasts of Ireland, Iceland and Maritime Canada, dulse is an edible sea alga that has been harvested as a source of food for thousands of years. It has a chewy texture and rich taste. You can find dulse in most health food store and sometimes the seafood section of good grocery stores. It comes in sun-dried form and looks like, well, seaweed (pictured above), but you can purchase it dried and powdered as well. Adding dulse to soups, stews and salads is a great way to introduce it to your diet. Especially when using the powdered form, you can easily sneak a whack-load of vitamins into your kids’ mac n’ cheese without them knowing! Horray for nutritional deception. I’m all for it. Dulse is a good source of vegetable protein, iron, potassium, magnesium, iodine, chlorophyll, enzymes, Vitamin A, Vitamin B’s, and dietary fiber. I would look for organically certified dulse, or at least a good product that has been tested for heavy metals, chemicals, and microbiological contaminants. As we all know, anything coming from the sea these days can also be packed with nasty toxins. 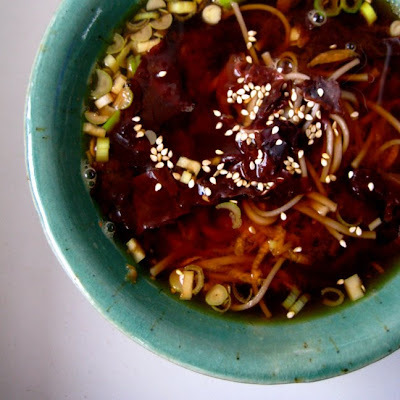 This recipe is superb for vegans, as both the dulse and miso contain high amounts of vitamin B12. 1. Boil water and cook soba noodles according to the directions. Depending on their thickness, the noodles should require about 5-8 minutes cooking time. 3. In the same pot, bring more water to a boil and let cool for a few minutes. Stir in desired amount of miso until dissolved. Tip: It is important not to boil the miso as this kills the delicate enzymes and nutrition it contains. I hope you’re enjoying your new-found love of vegetables from the sea. And if you haven’t been brave enough to actually give any of them a try yet, just remember: they will love you even more.